This Saturday night you have a Pre-Valentine's Day date with the guys in The Messenger Birds. The duo will be hitting the stage at The Loving Touch, which seems like the proper venue to host such a lovey dovey event. Joining them for the evening are their pals in YUM, Stikyfüt and Those Hounds. If you haven't heard The Messenger Birds yet, they're a two piece rock band made up of Parker Bengry and Chris Williams. They released their debut album, Everything and Nothing, about a year ago. These guys have been playing around town quite a bit lately, and you may have even seen them play as The Black Keys at Creepy Cheapy, at The LT's recent Bowie Night, and they're even playing as The White Stripes at this year's Detroit X Detroit. Even though they're great at playing as other bands, we suggest you check them out playing as themselves. To see what you can expect at Saturday's show, take a listen to that debut EP of theirs below. Tickets to Saturday's show are only $5 and they can be purchased in advance here. We HIGHLY suggest purchasing your tickets in advance because everyone that does will be able to get $3 beers for 3 hours before the show next door at the WAB. Really, who can think of a better Pre-Valentine's Day date? 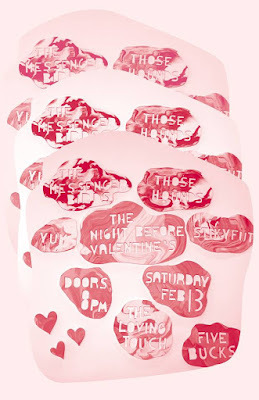 Cheap beers, great food at the WAB, and then an awesome cheap show next door at The Loving Touch! Sounds like a great night to us!